We’re excited to do a quick roundup yet again of the most popular DJ controllers sold in a year. This list is interesting because it gives you a great sense of what’s happening in the industry – what models are included (and therefore, winning) and what are missing. Keep reading to see what the top 10 selling DJ controllers were in 2017. As an online store, DJTT has many ways to track DJ gear sales data. But we know that because of our audience, what we choose to carry, and what sales we have, our store isn’t a good resource by itself for what’s happening overall in the DJ industry. So for this article, instead of our own numbers, we’re using data from industry reports. Out of respect for the data source, we’re keeping the data confidential by only listing these controller’s relative positions – no specific sales information is shared here. We’ve also included all-in-one standalone units (XDJ-RX/2) in this line up. In situations where a relatively small generational change has happened (XDJ-RX to XDJ-RX2; or DDJ-SR to DDJ-SR2), we’ve noted it and combined the sales numbers. A Rekordbox-oriented controller has cracked the top 10! This is big news, mainly because it means the #1 spot is in some level of jeopardy. It shows cracks in the years-running sales streak of the DDJ-S series, which is great news for advocates of Pioneer DJ’s own software. Amazing that a controller with so many other competitors continues to rank on this list. Numark has tons of other options that are very, very similar (or better) than the Mixtrack 3. Pioneer DJ deserves kudos – last year they took their quality XDJ-RX and updated it to the RX2, giving it features that no other standalone player (even CDJs/other XDJs) has. Read DJ Ravine’s review here if you want more details. We think this year sales will continue to grow – unless Pioneer DJ puts out a four-channel version. Yes, Numark’s odd standalone unit continues to hold the same spot on the top list. We really would have thought that much newer digital-only standalone units would have dug into the sales of this model, but it looks like playing CDs might still be a factor for some DJs. As we noted last year, this might be the most versatile unit on the lineup in terms of what type of media it can play, and that likely has a big impact on the sales. Numark created a natural followup to their Pro lineup with the Platinum. The on-jog display was a great addition – and likely helped convince Pioneer DJ to add a similar feature on their controller line when designing the DDJ-1000. This is the controller that Numark likely wants to be selling the most of – but two of their other models are still dominating (see below). Despite our claim last year that we would see the Mixtrack Pro giving way to the Mixtrack Platinum, it still held a higher position, selling nearly double the amount. Sometimes, as the rest of the list shows, having a controller that is notoriously recognizable is more important than features or newness. Also, the $100 price cut this year might have had an impact. If you’re a more experienced DJ, it’s easy to forget about the fascinating features that come built-in on budget gear, designed to attract the eye of a much younger user. The Party Mix has a built-in light show– with three lights that shine out of the back of the unit, and additional lighting pulsing along with the beat on the pads. This is the oldest controller on this list that doesn’t have an update, and the reasoning is pretty simple: Pioneer DJ and Serato DJ continue to go in different directions. It’s unlikely we’ll see a new SX – instead, we’ve got the DDJ-1000 for Rekordbox users, and Serato DJ seems to be spending most of their resources partnering with InMusic and Roland. A brand new update to this unit, the DDJ-SR2, likely made the difference in bumping it up to the #2 position this year. We called it out last year – since the original DDJ-SR was over 3.5 years old. It still came as a surprise though, because Pioneer DJ’s moves throughout the year seemed to indicate they were done releasing any more DDJ products that prioritized Serato DJ over their own Rekordbox DJ. Yes, back in the top spot is: the exact same controller as last year. Pioneer DJ has, for two years running, held down the top sales slots for DJ controllers. The SB2 is fascinating: it sold more units than any other controller on the list by more than double (or dramatically more). Budget controllers sell really well – and even Pioneer themselves (who likely would rather be selling Rekordbox DJ focused DDJ-RB units) can’t seem to get close to changing the public perception of this controller as the best go-to starting unit. Denon DJ’s MCX8000: Remember how Denon made a standalone all-in-one? Sadly, it just wasn’t able to ever crack this list, and as the focus turned more towards the Prime lineup, sales really started dropping in the second half of 2017. NI’s Traktor Kontrol S4 MK2: Despite being released all the way back in 2013, this controller still was just beyond the edge of getting on this list. It’s a testament to a legendary design and powerful software/hardware combination. Will 2018 have new Traktor units, or is it all over? We’re waiting to find out. Numark’s DJ2GO2: A really, really small new DJ device has made a sales splash – in just two months (released November 2017) it did sizable sales – enough to earn an honorable mention here. What can we take away from this list? The real sad news is that not much has changed. Pioneer DJ and Numark continue to dominate this list. Perhaps in 2018 we will see more stratification of brands (wouldn’t it be great to see Roland on this list? ), but for now, things seem very much the same. Wondering what last year looked like? 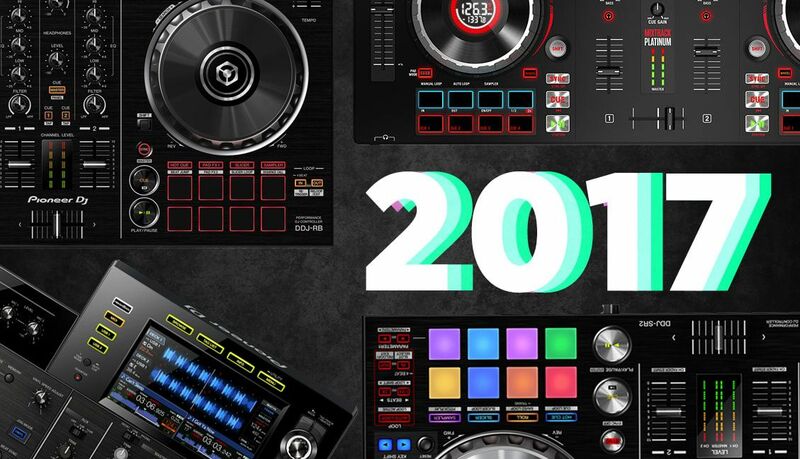 Click here for the top DJ controllers in 2016.